With National MI SafeGuard® 12 month rescission relief, we pioneered early rescission relief because you deserve the peace of mind that comes with reducing repurchase risk sooner. 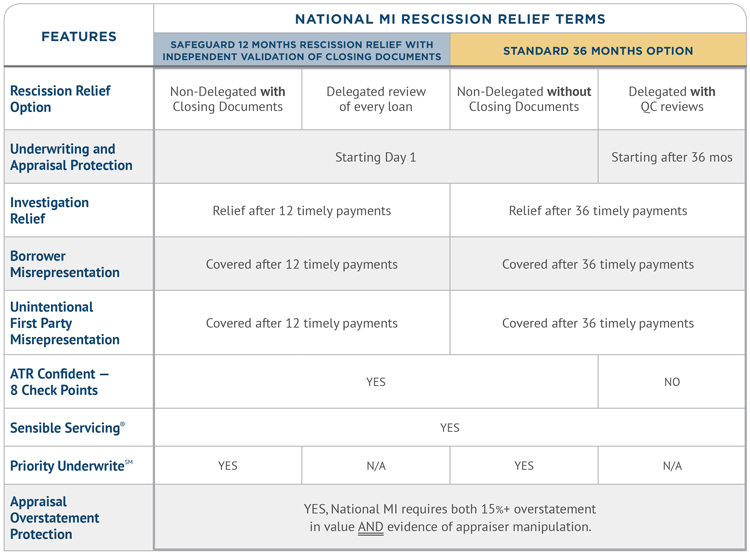 Whether you choose 12 or 36 months rescission relief, National MI is committed to bringing back confidence in the private MI industry. Unless presented with credible evidence, National MI will not initiate investigations after the rescission relief period. Other MI’s only define restrictions on how investigations are conducted. Other MI’s can rescind solely based on an appraisal overstatement of 15% or more. National MI’s policy requires both a 15% overstatement AND evidence of appraiser manipulation. Either way National MI’s terms are better than other MI providers. Please refer to National MI’s Underwriting Guideline Manual and Master Policy for a complete description of policies and requirements.